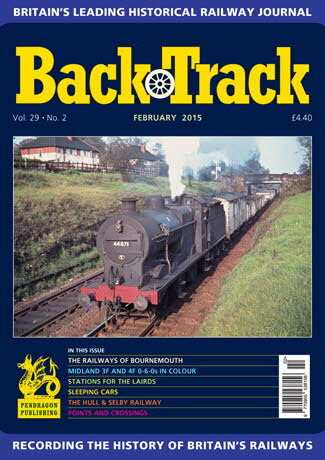 Railway Magazine | BackTrack February 2015 journal from Pendragon Publishing. On the Blackpool line - colour spread by Tom Heavyside on the Blackpool North line in the 1970s/80s. The Dugald Drummond 'Down Under' Myth - Darryl Grant investigates whether the former LSWR engineer did ever travel to Australia to set up a locomotive building business. Collisions in Fog - Alistair F. Nisbet describes a series of accidents on the Southern in the post-war 'smog' era. The Railways of Bournemouth - a history by Stephen Roberts. The Hull & Selby Railway - Jeffrey Wells presents the second part of his look at the first railways to Selby. Water, Water, Everywhere - four pages of archive photos of locomotives on water troughs. Midland Goods Heritage - four colour pages of the MR/LMS 3F and 4F 0-6-0s. Building the Top Rail Journey in the World - Ann Stewart looks at some aspects of constructing the West Highland Railway. Stations for the Lairds - John Roake visits some public and private stations and halts built for and by the Highland aristocracy. Sleeping Cars - George May considers aspects of their history and development. Helsby - A Cheshire Country Junction - colour photos by Alan Tyson from 1967. Life at Orpington Shed - recollections by David Evans of maintaining the electric multiple unit fleet. Do you need a Crossing to make a Point? - Michael B. Binks considers some aspects of railway trackwork construction. Working the Fish - some notes by A. J. Ludlam of Boston engine duties.